I'm not so sure...they don't have halos. One is pouring water from a pitcher, and the other has water coming from her hands. At first I thought it was the four corners of the earth? Four directions? Four season? Here's another pic, so you can see the baptismal font, below the images. Rain, cloud, salty water, sweet water? Well....I would think rain and cloud would be kind of the same thing. There is little of direct reference to four streams or four sources of water in the hymnography of either the baptismal service, or the feast of Theophany, nor the Great Blessing of Water, nor in St John Chrysostom's homily on the latter feast. In all four texts, the water of the Jordan, and of the baptismal font, is constantly referred to in plural form: waters, streams, etc. On this basis, unless I or others discover anything more concrete, it is safe to say that these four figures are purely decorative. There is an inscription in white lettering on the right-hand side of the baptistry ceiling. While I think it is most likely a commemoration of patronage and/or of the iconographer, is there any chance, Liza, that you could post an enlargement of this section? There you are! I was awaiting your input!!! Yes, I will enlarge that section and post. However, it's probably a "commemoration", as they were everywhere...."in memory of...., for the health of....."
I love keeping it real! Look at the outside of the church. It looks like those people who would live in that kind of place. Forgive me, but as a catechumen and totally unstudied in iconography, those definitely do not look "ideal" and fulfill your definitions above (thanks, I needed those words, due to my status). And I do not want those to be my "ideal" of heaven.....but the function they serve is to remind me that getting to look like your ideal, one must look like them here on Earth....or at least the "better" ones probably did. This image was produced for the purpose of using it as part of an anti-abortion campaign. Icons must never be used to promote social or political causes, even if such causes are good ones. God is above and beyond politics, and to turn a holy image into a sociopolitical mascot is nothing short of shameful. Really? Can you document when and where it was first written? And the artist has authorised that copies of this image are handed out during these rallies. I repeat: the use of iconography to promote sociopolitical causes, even "good" ones, is a shameful debasement of what icons are and stand for. No doubt, you are right. And it is true, two wrongs do not make a right. 10,000 words is conveyed in a single pictograph. And for those women who have known Christ and forgotten in their hours of need, pray this reminds them. We are NOT in heaven yet, Father. Some of us are left here on Earth to fight for what is good, true and beautiful. There are sheep, there are shepherds and then there are sheep dogs who fight the wolves that will devour your flock. Let those that are sheep dogs fight the ones that do evil. Fast and pray. Lord, forgive me, a sinner. I understand the icon, I've just never seen the Vine sprouting from Christ's side like that. 10,000 words is conveyed in a single pictograph. If you are sharing the road with me, I hope you are capable of reading very quickly. A person interviewed who was close to Vanga claimed that the (or his backers?) took people's money donations and built the ikons in this way without people or Vanga expecting this. It claims towards the end of the clip (about minute 37) that the clergy were forced to consecrate the chapel/church after refusing to do so. From what i know, that Church is not consecrated at all. Can you summarize what is in the interview? What is Vanga saying, and what is the bishop's response in the movie? Unfortunately I only know Russian, and all I clearly understood was that she said "this church is not good". By the way, this surprisingly reminds me of a dream I had last night, where another teenager was walled inside a basement with a mural icon across another wall, and my friends and I were going to rescue him. Vanga's dying wish was for her to be buried in the yard of her little house so that people could draw strength from her grave... The ‘Vanga' charity foundation decided to refuse her request and she was buried near the ‘St. Petka Bulgarian' church. ^No idea. I copied them from another forum. I'll ask where the poster found them. Save for the whole dove thing. I don't mind the dove but I'd like to see Christ depicted as a small adult. Uncut Mountain Supply sells them under "religious paintings." 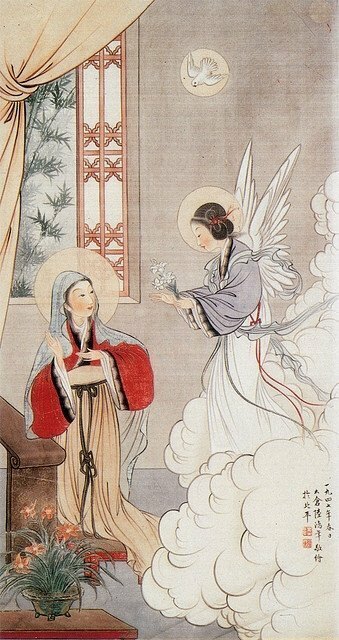 It doesn't say who originally did them unfortunately, but refers to them as "Chinese silk paintings." This makes the least sense possible. But hey, I am sure LBK will agree in part with both of us. What are the the jury's thoughts on this one? Poking small printed icons into the frame of a larger one is nothing unusual. The photo of the little kid could be in memory of a child who died at a very young age. Fixing military insignia on the frame is a bit much, though. IIRC this and similar neo-Stalinist abominations were covered in the "Schlock icons" thread. 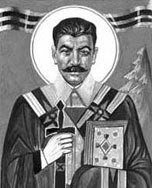 Somewhere here I have discussed how this is not a proper canonical icon of Stalin. For one, there is no record he ever was a bishop. Instead, he should be portrayed in uniform. His death was under mysterious circs, so it could be martyrdom, but it works better if he's holding a scroll with some text of his voluminous writings. Or he could be depicted holding the cathedral of Christ the Savior. Very good, Grasshopper. Very good. 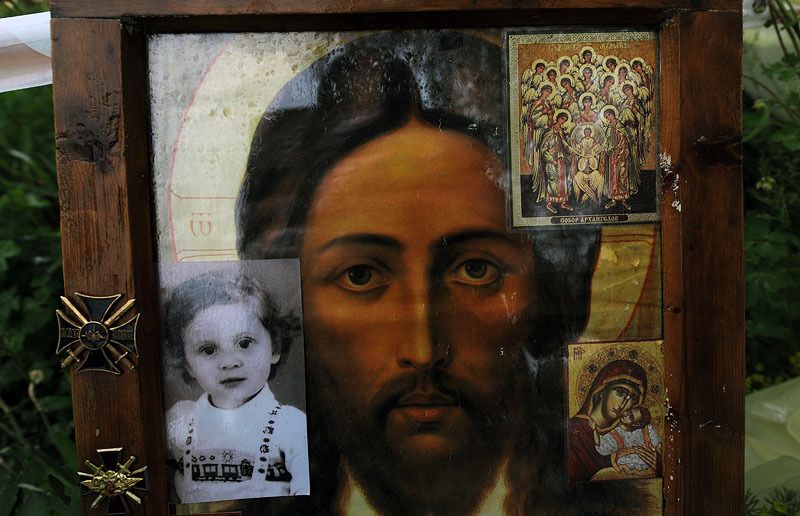 I mean the style of the icon of Christ. Falls short in many ways. Bland and anodyne, IMHO. Well, the Metropolitan comes to Vanga to tells her that there are obstacles for the consecration of the church, that the canons are clear and that they need to be respected, because the Church is one, and if she is member of the church, she must respect that. She then answers to him that his words come late, that there are two days late. and also says that even the first time when the Metropolitan came, said that this church is not good. Then she says all will be fixed, that the place is holy, a place were young people have died and that it is late to talk now (for changes) after which she starts saying to him that he is Bishop, that and that the church will be consecrated and blessed, a priest will be put, a keeper. Then she says that he must be soft as cotton and sweet as sugar (in Slavic languages, that means to be good and gentle). The Metropolitan says that the people around her are confusing her, she says to him the same. Then she says that she was visited by 300 people a day, and that his job is easy and starts talking about her past. The Metropolitan tries to explain that things are not so simple, but she continues to say that the church will be consecrated and makes plans for keeper. She mentioned also the entry of Christ at the Temple and his reaction towards the traders. The Metropolitan again tries to explain the things in the church, she then says that she wants to go to bed. Then the Metropolitan says to the person that makes the interview about the situation when the Apostles were brought before the Jewish priests and that what is made by God will not fall, and by man, no matter how much tries, will be destroyed. He ends saying: if this temple is a reason for the soul of Vanga to be lost, it is better the temple to be gone! Тhat is all for which Vanga spoke with the Metropolitan. Thank you for your very good explanation of this very interesting video. I had assumed that things were the other way around. I think someone here had said that Vanga did not want the icons the way they were. Plus, I noticed that she wanted to be buried by her house. I don't know what to make of it. For example, was it organized by freemasons, for example, or just a home-grown group of "new agers"? Yes, that was her wish, but the foundation did not respect it, and buried her near the church. The pictures in the church were made by Светлин Русев (Svetlin Rusev), the man with the glasses in the video, working in the church. I do not know what to say too, because i do not know much about this person. That sounds very interesting, and I would like to hear more about it. Perhaps the best explanation is that she was not a bad person, and was a person with a gift, but also was not an extremely holy person either like we normally associate with the gifts. I don't see anything proving she was bad. And I allow that religious customs and styles change. Perhaps some of the Old Believers' ways were better. On the other hand, I am confused why, if she was a holy person she would not follow the bishops' strong advice, especially when it comes to a matter of "church business"- like building a church. The original 1967 movie Viy was filmed in an abandoned cossack church. The original Man of Steel needs some irony in his iconography. Fantastic. And who you calling snarky? Wit and snark are not the same thing. ^Whether a comment is "snark" or "wit" typically can be found in the ear of the listener or reader, as the case may be. I came across a brief piece on this subject a few years back, written by an upstate NY reporter. "When Dorothy Parker said “She runs the gamut of emotions from A to B.” It was funny, biting and witty. But you don’t hear that style of “funny” as much any more. Rather what you read in newspapers & blogs and hear on television shows is just as mean, but without the, let’s call it, panache. And Snarky is Witty’s cheap, lazy cousin." Wit is an art form. Snark is not. Precisely, my dear podkarpatska. Precisely. "The Hospitality of Abraham in the style of St. Alban’s Psalter, by Peter Murphy"
Please stick to adjudicating what you think are proper icons and stay away from humor. You do a poor enough job of the former in spite of all your expertise. I can't imagine what would become of the world, if we had to wait for you to OK every attempt at wit. LBK ain't going to like this because although you can't depict God the Father as an "old man" nor at all, you can depict Him as a man in this particular icon. 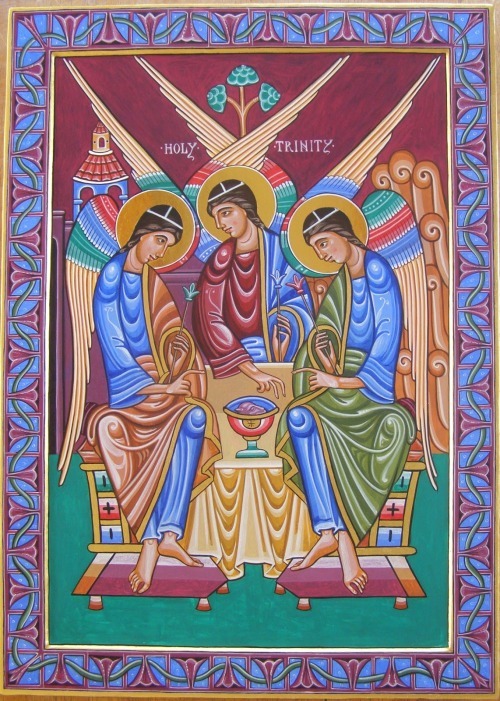 Making the icon so precise to bring out the noetic nature of the visitors to Abraham I think means you can no longer have your Trinity cake and eat it to.